Below is information on ways you can help with some of our mission projects. The deacons are need of Warnerites who would be interested in assisting with the delivery of flowers from the Sunday service to homebound members and friends. The deacons are fewer in number this year, so any help you can give on an occasional basis would be very welcome. This is a great way to get to know our homebound folks, and all of the deacons agree it is a rewarding experience. You do not have to be a former deacon to help. Call the church office for more information at 301-949-2900. Thank you for your generous support of the Two Cents-a-Meal program over the summer months. Over $500 was collected in July and August and Warner's discretionary 40% was sent to aid the Meals on Wheels program. In September and October your donations will go to Farmers and Hunters Feeding the Hungry. Volunteers are needed on the third Sunday of each month to keep this ministry going, so please contact Ann Rakow if you are interested in helping count. Please enjoy refreshments in the Social Hall after worship service as usual, and then come to the Common Room. The food pantry at Mid-County United Ministries is in great need of replenishment! They can only accept non-perishable foor items such as hot/cold cereals, tuna/canned meat and peanut butter. Because the size of the pantry it limited, please do not bring "super-sized" donations. 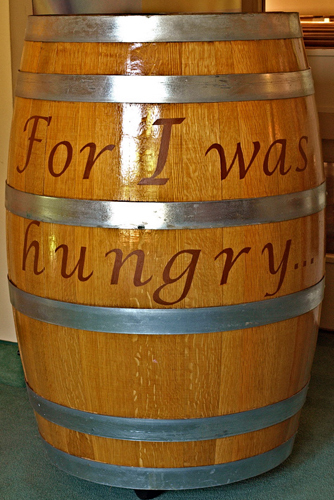 Place your offerings in the "I was Hungry" barrel in the narthex. Thank you!